Buy issue #1 now at Comixology! | Read the rave IGN review! An ongoing Valiant Comics series written by Greg Pak and drawn by Trevor Hairsine. Starting September, 2013. Huge Comixology sale on my ETERNAL WARRIOR run! For a limited time, you can get all eight issues of my ETERNAL WARRIOR run in digital form from Comixology for just $6.99. That’s a 69 percent savings and I highly recommend it. Check it out. Eternal Emperor is magnificent epic journey through what feels like an entire epoch. It’s small and unimaginably vast at the same time with the question of the inevitable curiosity of man leading to its own destruction at the heart of it. Greg Pak and Robert Gil leave all the detritus of the past, both Gilad’s fictional history and the publisher’s established continuity thus far, and plunge the reader into a fully realized future that is mesmerizingly beautiful. Nothing is required to enter into this arc, save for an open mind and a taste for truly captivating adventure. And if you’d rather buy a signed physical copy of the paperback, visit the Greg Pak Shop before they’re sold out! Comments Off on Huge Comixology sale on my ETERNAL WARRIOR run! 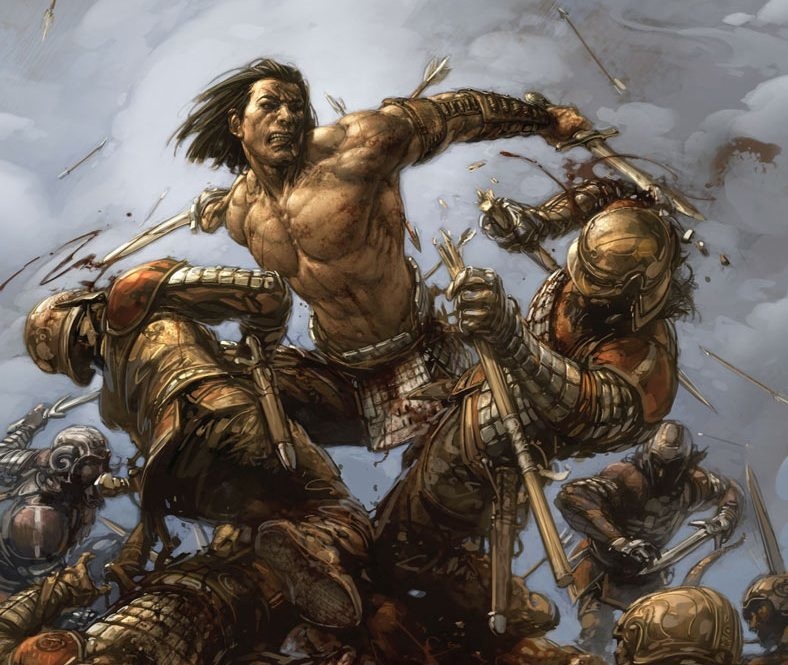 Greg Pak’s “Eternal Warrior” run on sale cheap at Comixology! Just noticed that Comixology is running a Valiant sale that includes both volumes of my “Eternal Warrior” book! You can get each volume for a ridiculously low price — $3.99 for the first volume and $4.99 for the second. Check out all the Valiant books on sale here! And I’m just gonna say it: the second volume, featuring the “Eternal Emperor” post-disaster story set in the future that I did with artist Robert Gill, is one of my favorites of all the things I’ve written in the past few years. Loved every minute of working on this story arc. We got to tell a mind-bending story set 2000 years in the future that introduces a whole new world along with a brand new character, Gilad’s granddaughter. Robert’s art is just amazing — it thrilled me and it even broke my heart a little in just the right places. Hope you’ll consider checking it out! Comments Off on Greg Pak’s “Eternal Warrior” run on sale cheap at Comixology! 2014.03.26 – “Eternal Warrior” #7 out today! The latest and greatest issue of “Eternal Warrior” hits stores today, and I hope you’ll consider picking it up. Without any exaggeration, I think this might be one of the best things I’ve written in a while, and Robert Gill’s pencils, Guy Major’s colors, and Dave Sharpe’s letters are just stunning. The story’s about an immortal warrior who’s become the quiet protecter of a small farming community in a near-idyllic post-disaster world. But humanity has a way of repeating its mistakes, and soon our hero and his wide-eyed granddaughter Caroline must enter a new world of growing technological wonder and terror. I’ve been playing with pace in this story, really taking all the time I can to establish the world and the quiet relationships and little moments that drive the big emotional story. There’s a moment in issue #6 that’s a splash page showing nothing but a child’s face, and I think it’s one of the best things I’ve written all year. If you’ve enjoyed my other work, I hope you’ll give this book a shot. The current storyline began with issue #5, and issue #7 hits stores today. If you read your comics digitally, you can grab everything at Comixology. And read on for a preview of issue #7. Comments Off on 2014.03.26 – “Eternal Warrior” #7 out today! 2014.03.26 – “Eternal Warrior” #7 preview! “Eternal Warrior” #7, written by yours truly with art by the amazing Robert Gill and colors by Guy Major, hits stores on Wednesday, March 26 — and you can check out a colored, lettered preview right here! The story is set two thousand years in the future and features a weary immortal picking up the sword one last time to try to save his granddaughter in a post-disaster world. I’m really proud of the book — it’s got huge action, as you might expect from a Eternal Warrior story, but we’re doing our best to run the entire tale through with gentle humor and deep emotion. Please do consider grabbing it — the story arc started with issue #5. Comments Off on 2014.03.26 – “Eternal Warrior” #7 preview! “Eternal Warrior” #2 hit comic book stores yesterday. From the art to the characters to the big, sprawling story, Eternal Warrior is a true work of art. It’s hard to not be captivated by this series; it’s just a fantastic comic book. Ask your local shop to hold a copy for you — or buy it now from comiXology! 2013.10.10 – 10.13 – Greg Pak’s New York Comic Con Schedule! I’ll be at the New York Comic Con all four days this year, in Artists Alley Booth K1 and at the various events listed below. Can’t wait – it’s gonna be a blast and I hope to see you there! Description: The Last Son of Krypton is one of the most recognized pop culture icons of all time, and this year, as he celebrates his 75th Anniversary, Superman is set to soar to new heights! Come by for a panel on what makes The Man of Steel the hero that he is with the writers and artists that bring him to life! Description: MUST READ VALIANT. You’ve heard the buzz. You’ve read the reviews. Now, with UNITY just weeks away, join an all-star panel of Valiant creators and special surprise guests to find out why VALIANT is the MUST READ publisher of the year. X-O Manowar and the dawn of UNITY. The shocking surprises that lay in wait for SHADOWMAN ETERNAL WARRIOR’s next savage quest, ARCHER & ARMSTRONG and the mad, mad, mad fallout of SECT CIVIL WAR. Things getting (even more) complicated for QUANTUM AND WOODY. It all happens right here with an exclusive round of news and announcements, only at NYCC! Description: Comics writer Greg Pak (“Batman/Superman,” “Planet Hulk”) and internet superstar musician Jonathan Coulton discuss their graphic novel “Code Monkey Save World,” Kickstarter’s highest grossing original comics project ever. Learn how they ran the campaign and get a sneak preview of finished pages! Also, free stickers! Description: Dynamite celebrates its 10th anniversary in 2014. Join a panel of superstar creators and Dynamite’s editorial staff, and find out what surprises they have in store for next year! What’s the latest updates on projects by J. Michael Straczynski, Gail Simone, Steve Niles, James Robinson, Mark Waid and Peter Milligan (just to name a few)? What explosive stories will be told in the upcoming series TWILIGHT ZONE, BOB’S BURGERS, ASH AND THE ARMY OF DARKNESS, and more? And – most importantly – get ready for a whole new wave of mind-blowing announcements and 2014 SECRETS REVEALED! Comments Off on 2013.10.10 – 10.13 – Greg Pak’s New York Comic Con Schedule! The first issue of my new “Eternal Warrior” series for Valiant Comics hits stores this Wednesday, and I’ll be doing a signing in New York City starting at 6:30 pm at Forbidden Planet, 832 Broadway! Newsarama: Greg, you’re no stranger with writing superheroes, swordsmen and immortals. So when you were approached to write Eternal Warrior for Valiant, what was the challenge and the intrigue that led you to sign on the dotted line? Greg Pak: I love these kinds of characters. There was something familiar here about Gilad, and I was hungry to jump on. I felt like I could do a good job on this kind of character, who’s both a warrior and an immortal. Those are things I’ve enjoyed exploring in the past as you’ve mentioned. What’s specifically intriguing about Gilad is two things. One, he is just a normal dude. Yes, he is one of the greatest soldiers and hand-to-hand combatants ever born, but he has the soul of a mortal – he wasn’t born as an immortal. So for him witnessing the rise and fall of civilizations and seeing everyone he loves turn to dust, it’s not something he can just shrug off and get over. Humans like you and me – and Gilad – weren’t built to go on forever. We’ve essentially evolved to die; evolved to have short lifespans. Our minds and our bodies aren’t built to go on forever and to watch everyone you know fade away. So despite his moniker of the Eternal Warrior, he’s got the soul of a mortal and his predicament troubles him… and that’s an intriguing thing to tackle. Click here to read the whole thing! And ask your local shop to order a copy for you today! Another “Eternal Warrior” preview – pre-order issue #1 today! Valiant Comics has released another lettered preview of “Eternal Warrior” #1, written by yours truly with art by Trevor Hairsine, colors by Brian Reber, and letters by Simon Bowland. Pretty proud of the way this book’s coming together — please do feel free to contact your local comics shop and ask them to order you a copy! The book goes on sale September 11. Comments Off on Another “Eternal Warrior” preview – pre-order issue #1 today!